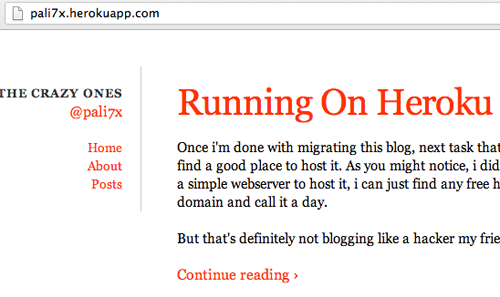 Once i’ve done with migrating this blog, next task that i need to resolve is to find a good place to host it. As you might notice, i don’t need anything but a simple web server will do. I can just pick any free hosting, point my domain into it and call it a day. But that’s definitely not blogging like a hacker my friend. I was looking for something more subtle than conventional hosting. I’ve spent quite amount of time trying to find some good hosting. If you’re looking for good free hosting with no ads, there is only one that i can recommend - serversfree.com . They’re so good that almost sounds good to be truth, and they gave a lot more features than what paid hosting could offer. I did looked into few offers from local hosting in Malaysia and for 1GB storage with 1GB bandwidth, they’re asking for about RM50 per year. Triple that and you’ll get 2GB of storage with 10GB of bandwidth. Like that’s going to happen. I could always rent a Virtual Private Server (VPS), but that’s definitely overkill just to host a bunch of static files. I don’t think its an effective investment since i didn’t blog that much, and there are too many things i need to think of and having to manage my vps isn’t one of them. At this point, i guess i don’t really have any choices. Well, Maybe Not. 1. I do skeptical about free stuff. 2. I am more concern about speed and availability than point 1. 3. Above all, i don’t wanna use FTP app to publish my blog. So i took a look around again this time, and although i heard about Heroku for some time now, i didn’t realize that you can use it to host your blog for free (with some exception, of course) until i read a post from some developers. Developer productivity is our battle cry, at the core of everything we do. Why require three steps when one will do? Why require any action at all when zero steps will do? First thing first, sign up for Heroku account. And then, download the toolbet. Required to use Heroku. Done. 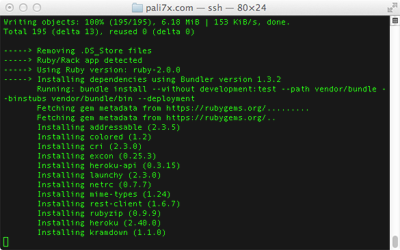 Since Heroku use Git for deployment, so you might wanna learn one or two things about Git. Its just simple as that. But we’re not done yet. We can’t view the web app yet since it did not recognize our app and won’t be able to assign proper framework for it. Since Nanoc is based on Ruby and i can use Rack (A Ruby Webserver) to serve my blog, i just need to create a Gemfile and Heroku will automatically pick it up and instantly recognize it’s a Ruby app. Aside from Gemfile, Rack requires its own configuration interface. Just create config.ru and put both of them in your site’s root. If you know what you’re doing, you don’t even need all the gems. Now we can push our webapp alive. But we’re not done yet. Since i bought my domain for blogging, let’s use it. and its should appear on your Heroku’s dashboard. Now its just a matter of pointing your domain to Heroku. This might sound easy enough, but unfortunately i ended up submitting a ticket for technical support of my domain hosting because their A records won’t accept duplicate domain with different IPs. I solved this problem by switching to third-party DNS. Maybe i’ll switch my domain hosting as well in future. You should be able to browse using three surfix - yourdomain.com, www.yourdomain.com and yourapp.herokuapp.com. That’s good. Using rack-rewrite, we’ll have that fixed and pointing to one domain. Add, commit, and push it. Done. As i mention early of this post, it’s free to host this blog on Heroku as long as you don’t need to scale with the demands. 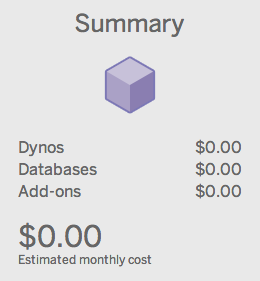 Heroku’s pricing is based on resources you use and they have nice calculator to calculate estimated monthly cost for you. However, even with their free plan i found it’s more than adequate to serve few static files with moderate visitors. Still, it might not everyone cup of tea, but if you can embrace it, i am pretty certain it could save you a lot of money. Now, i need a bucket to host all my images. And perhaps, i could spend some time to optimize this blog as well.